Exploring the country side around our new (for now) home, La Paz, Mexico has been an interesting treat. We have found that road maps are pretty much meaningless. Conservation areas, Reserves, and Biospheres, while not uncommon, are mostly undefined as far as boundaries go. Promotional flyers and signs often show animals and birds that do not exist here on the Baja. So, it is with this knowledge, that we set out into the Sierra De La Laguna Biosphere, in my never ending search for the endemics of this area, specifically the San Lucas Robin. This bird is now starting to obtain Unicorn status, I just can’t seem to track them down. On last Saturdays trip, we ran across one of the many signs within the Biosphere, that list the unique bird, animal or plant of that area. As we passed this sign, I had a bit of a good laugh. 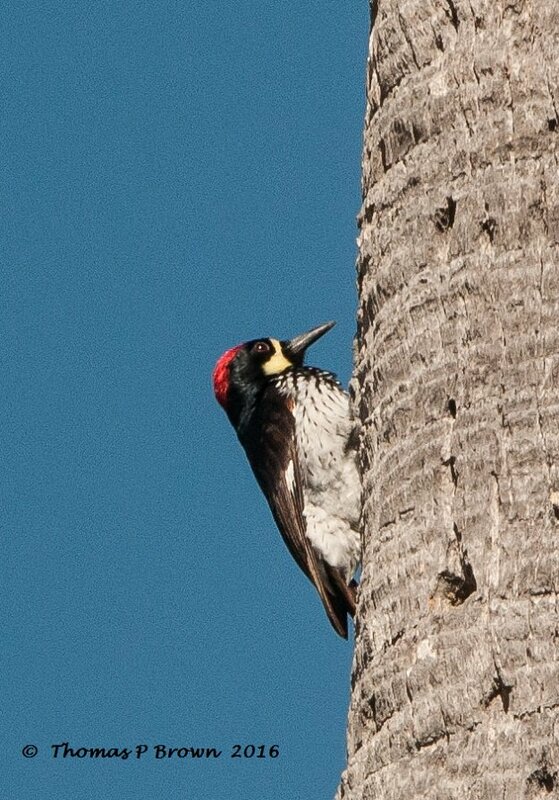 We are at 2000 feet altitude, in dry chaparral, desert scrub, and the feature on this sign was the Acorn Woodpecker. You gotta be kidding! 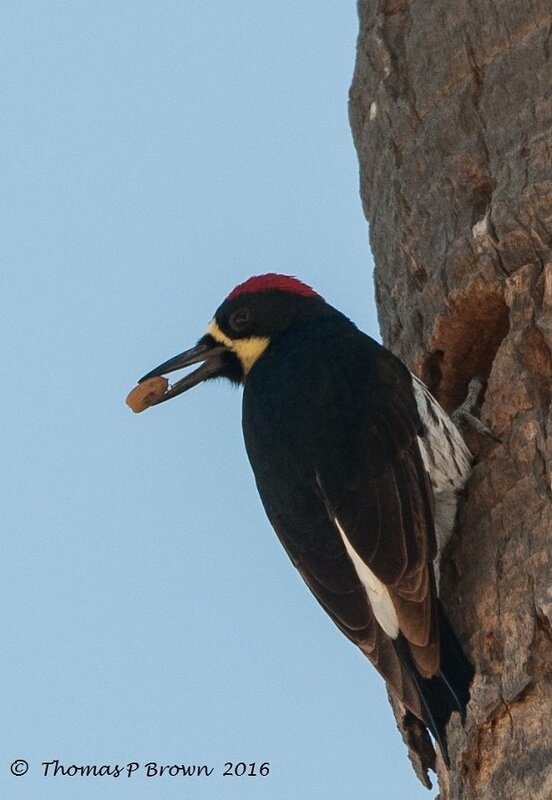 We are so far from any kind of habitat or plant life that would possibly support the Acorn Woodpeckers. 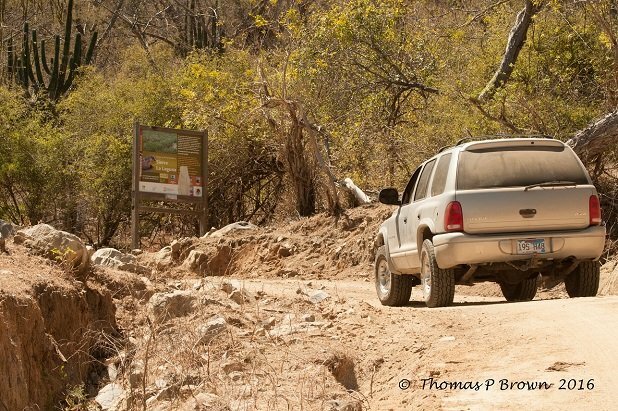 Many bumpy, dusty, hot miles later, we drive down into a large river bed/arroyo, and find a small fresh water stream, that appears to run year round. All around this small stream, are 30-40 tall mature date palms. On the sides of the arroyo are small scrub oak tress. Low and behold, the trees are full of Acorn Woodpeckers. At that point, I am pretty sure you could have knocked me over with one of the primaries from these beautiful birds. Back and forth across the arroyo they flew, in and out of the oaks with a steady stream of acorns, filling the already dug pits in the palms. I was able to get a lot of decent photos, but nothing spectacular. I made my lovely wife promise me that we would return for an extended stay, perhaps a weekend with the Acorns. The real surprise came later when I was processing all the photos. I knew something wasn’t right, but I just couldn’t put my eye on it……WAIT, that’s it. The eyes. 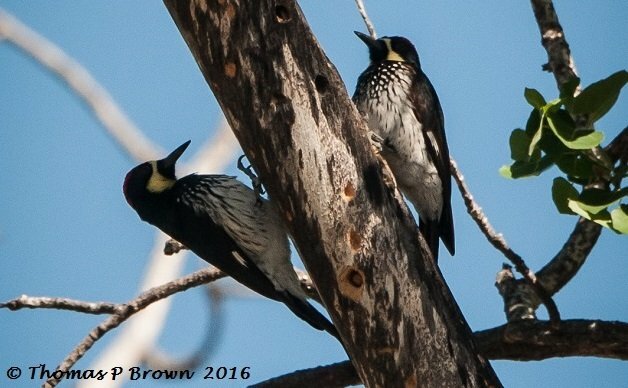 They were black, not the usual bright white of every other Acorn Woodpecker I have seen. I could see it now, a whole new species, with my name following in italics! 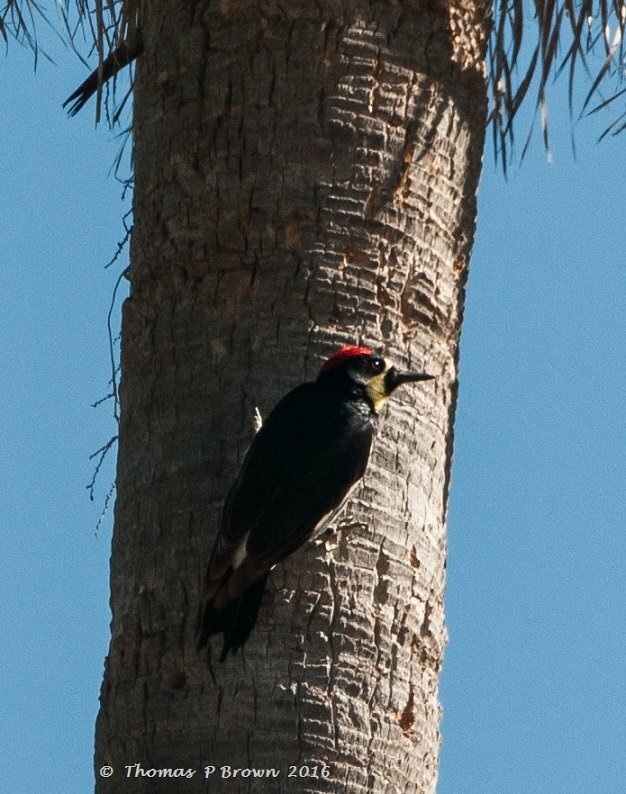 Hours of research later, I find that the sub-species, Melanerpes formicivorus angustifrons is well documented, but in all the research and data, there is only one mention of the dark eyed Acorn Woodpecker. Stay tuned, I will keep digging, and who knows, maybe I will get those italics after all. Thanks!! But I am pretty sure that “infamous” will be a better description.